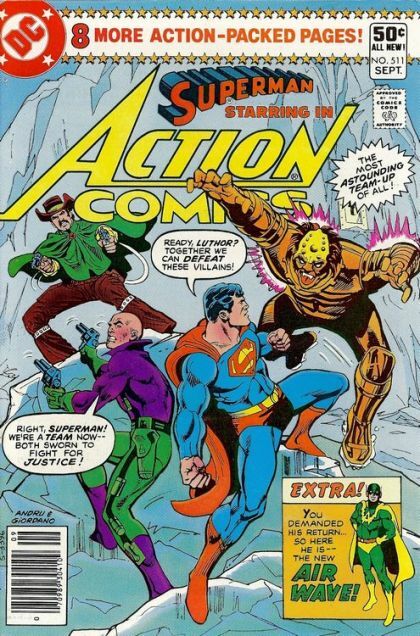 Luthor Fights For Good! / A New Costume For Air-Wave! Lex Luthor tells us all he has turned over a new lea and begins a campaign to prove it. He disarms all the nukes, refills the Ozone layer and cures some disease. Supes is unsure but he screens him at the Fortress and Lex shows to be clear. At the same time Terra-Man and friends decide to attack Supes for the reward, but Lex and Supes team up to make short work of them all. But is Lex really now a good guy? Airwave stops some kids doing a prank and then goes to school. while at School his Brother and sister rip his costume. His Mom then fixes it but gets some of the details wrong... oh well he now has a new costume!